There are only two species of lotus in the world: the American lotus or yanquapin (Nelumbo lutea) and the Asian sacred lotus (Nelumbo nucifera). Today, many hybridized lotus grace gardens with flowers ranging in color from white and yellow to pink, rose, magenta, peach and coral and gradations in between. All lotus flowers are day-blooming. Growing from rhizomes, these aquatic plants extend both their rounded leaves and flowers high above the water surface in summer. While the leaves are present in the warmth of summer, a tall stem rises from the underwater rhizome root with a swollen flower bud. The stem that attaches to the base of the flower bud is called the peduncle. The flower bud is covered in pale green modified leaves called sepals. 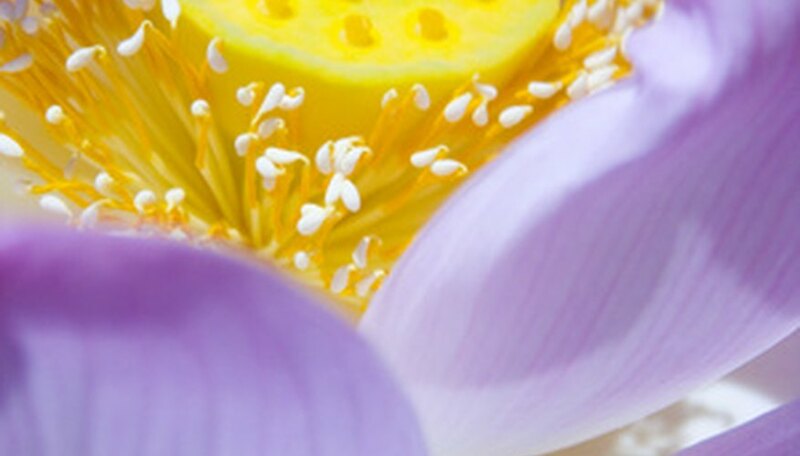 The sepals slowly open to reveal the first colorful signs of the lotus flower's petals. Usually the sepals turn color to match the petals. Once the sepals fully retract and allow the petals to open wide, the sexual organs are revealed in the center of the lotus blossom. The flat-topped, usually yellow cup-like structure in the middle is called the carpellary receptacle. Atop the receptacle are many bumps that are stigmas, the tips of the female pistils that each houses an ovule. Around the base of the receptacle, wedged next to the petal bases are the male organs, the stamens. Numerous stamens with tiny stalk-like filaments are topped by the anthers, which split open to release the pollen. Wind and insects relocate pollen grains to the receptive stigmas on the top of the carpellary receptacle. After pollination of the stigmas on the female pistils, the entire lotus flower begins to fall apart--stamens, petals, sepals drop to the water surface and float away. The carpellary receptacle begins to swell as each fertilized ovule in the base of each pistil develops into a seed. The receptacle broadens and slowly begins to ripen and dry, eventually turning a brown color. Within each hole or depression is an embryo that matures to a dry brown seed. The peduncle begins to dry and tilt the receptacle, now a seed capsule, so that the ripe seeds can roll out of the pits into the water. Sometimes the entire stem flops over into the water from winds or the sheer weight of the seeds.